Labour made its closing argument ahead of Friday’s referendum at a press conference in Dublin today. THE LABOUR PARTY has put forward its closing argument for abolishing the Seanad, saying that the case for retaining the upper house has failed. At a press conference in Dublin this morning the party’s director of elections Alex White said that the arguments for the No side have concentrated on the “purported potential of the Seanad rather than anything it has in fact achieved”. 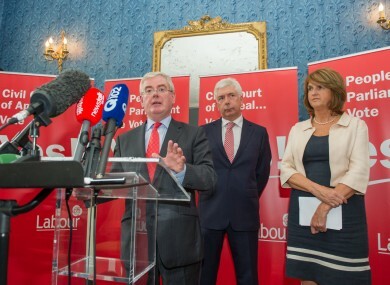 At the same event, the Tánaiste Eamon Gilmore said that Labour was asking people to vote Yes to two “very straightforward” propositions, referring to both the Seanad vote and the referendum to establish a Court of Appeal which also being held on Friday. White, Gilmore and Labour’s deputy leader and Social Protection Minister Joan Burton all urged people to come out and vote on Friday. Burton claimed that the fall in the Live Register numbers today was a “product of the reforms” implemented by the government and said the Seanad vote was another of these. She said a Yes vote “is going to give us a further step towards a more streamlined and cost effective political system” and said that single chambers served Denmark, Norway, and Sweden – which itself experienced a banking crisis in the 90s – “perfectly well”. Gilmore said that what the government is implenting is the “biggest reform of local government since the 19th century” referring to abolition of town councils and reduction in the number of councillors for next year’s local elections. The Tánaiste and the Taoiseach are expected to discuss their political reform proposals and specifically their Dáil reform plans with the leaders of the opposition parties later today. Email “Labour: 'The case for retention of the Seanad has failed'”. Feedback on “Labour: 'The case for retention of the Seanad has failed'”.